I’ve tried out hundreds of themes, and my experience is “don’t fight the theme.” If you find you are struggling with a theme then it is likely because you chose the wrong theme for the job, or YOU are not flexible enough. Huh? Yes, I don’t know how many times I struggled with something and then realized I don’t have to do it the way I first thought. On some ideal level, your theme and your imagination mesh, but unless you are a millionaire who can hire a team to make the theme work exactly as you want, or you are a talented theme designer without unlimited time, there will always be a gap. To pick a good theme for the site, you have to understand the site purpose and how different theme designs can make that easier or harder. So let’s explore different themes and the types of features they offer. When you are shopping for themes there is often a filter for selecting theme category: blog, magazine, restaurant, application, ecommerce, and so on. In this article, I explain how to understand these categories to find the theme you need. A few of the theme categories from the Themefuse website. The cssigniter theme shop uses these categories. Theme categories from the Elegant Themes website. Theme categories from the ThemeIsle marketplace. Blog themes emphasize readability and focus on displaying text content attractively. Some blog themes are minimalistic while others use typography, white space, and images in a sophisticated manner. Blog themes are used to communicate and display a “brand.” Many companies and organizations have blogs, which brings up the point that most themes will support a blog section. The difference between a blog theme and other themes is that the blog themes focus on the post. Another feature of the blog is the “archive” of posts that are organized by date or category. These listings are sometimes used as the front page of a blog. 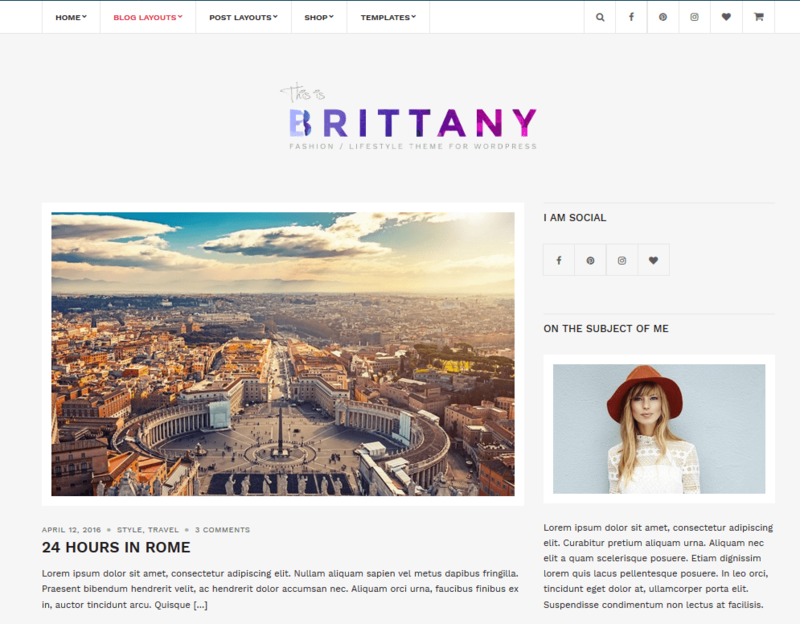 Brittany targets fashion and culture bloggers with a large number of layouts, lots of Customizer options, widgetized home page, and is designed to work with popular page builder plugins. There is a lite version with fewer options available on the WordPress.org theme repository. 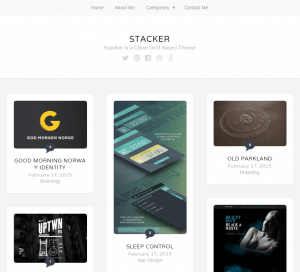 The Grandstand theme is a minimal blogging theme that includes a page builder. Splash is a Genesis child theme. It is designed for building leads and social engagement with a built-in subscriber form and stylish design. Magazine, newspaper, or news themes organize content by category. You know how magazines and newspaper have topical sections like news, technology, sports, entertainment, and so on? These are represented in WordPress by using different post categories. Magazine themes have sections for each category. Another hallmark of magazine themes is that they display their articles using a masonry, grid, or “Pinterest” style display. Of course, blog archives might be displayed in that manner as well, but magazine themes almost always have this type of display on the homepage. The Extra Theme includes the Divi page builder, advanced category options, and rating functionality. 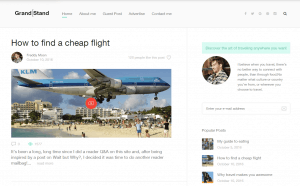 The Oblique Pro theme is a stylish magazine and blogging theme with lots of Customizer options. There is a free version available on the WordPress.org theme repository and a premium version with more options from the ThemeIsle website. The Pinmaister theme has a widgetized home page, a builtin favorites button, lots of Customizer options, and support for front-end user submissions. 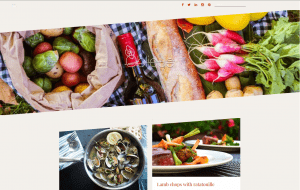 Themes designed for a business niche are a popular type of theme. They include areas for contact information, a map, and a team profile. 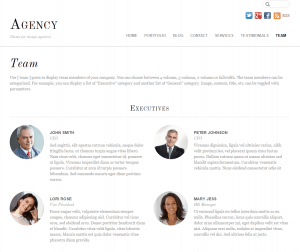 The Agency theme is a minimal, yet stylish theme that includes highlights, team, testimonial, and portfolio custom post types. It also includes a page builder and lots of customization options. 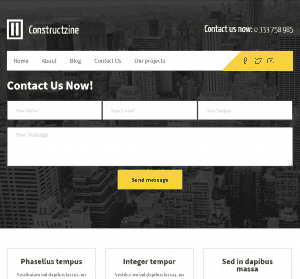 The Constructzine Pro theme is geared towards businesses that want to capture leads. The home page has sections for services, teams, and activities. The Customizer has lots of color options to match the business marketing styles. There is a lite version available on the WordPress.org repository. In the WordPress universe, “ecommerce” is often synonymous with WooCommerce. WooCommerce is an ecommerce solution that installs into WordPress as a plugin. When you see a theme categorized as an “ecommerce” theme it usually means that there is styling for the basic building blocks of an online store, such as multiple and single product pages, a shopping cart page, and checkout pages. This extra styling helps to preserve a consistent look and feel across the site. 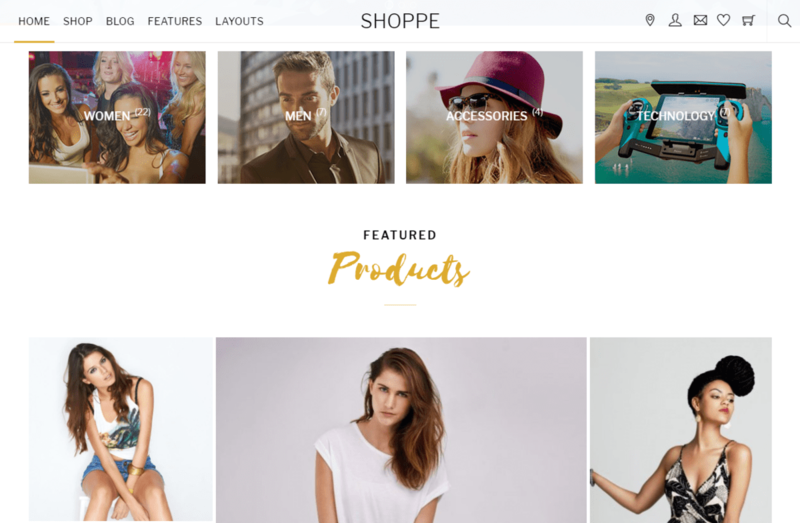 Shoppe is designed to work with WooCommerce. It includes a page builder, an AJAX shopping cart, wish list functionality, light box, product search and more. Simple is an ecommerce theme that is designed for letting you build a Shopify store using WordPress. It includes a page builder and lots of Customizer options. 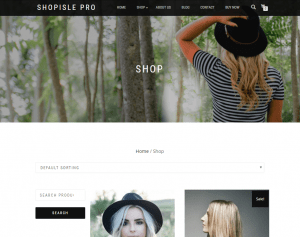 The ShopIsle Pro theme is designed to work with WooCommerce. It has a customizable home page that allows you to feature and arrange products as desired. It includes image and video background options. 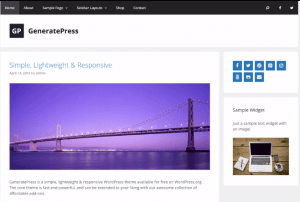 There is a lite version available on the WordPress theme repository. Portfolio themes are used by artists, designers, freelancers, and businesses to display screenshots and overviews of their work. There are a lot of plugins that will add a portfolio custom post type to the WordPress backend for entering this type of data, but portfolio themes also have the theme templates for displaying it. The Reel Story theme is designed as a video and photography theme for blogging and showing off your portfolio. It comes with a page builder, lots of options for customization, layouts, and a portfolio module. 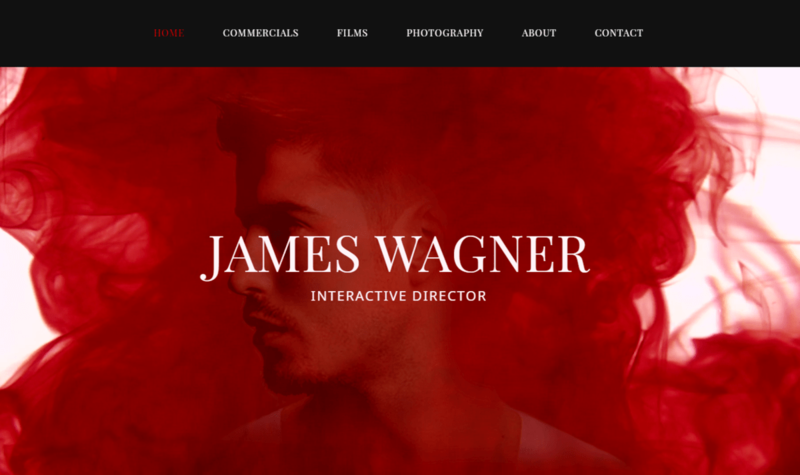 The Stacker theme is designed for photographers, artists, and designers who what to show off their work using a stylish masonry design on their homepage. Video and audio themes make it easy to embed these types of files, or more usually, links to them, and attractively layouts out controls for playing them. 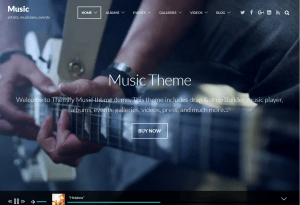 The Music theme comes with a page builder, allows for an embedded music player, video backgrounds, playlists and more. Album, events, gallery, video and press custom post types have already been created. 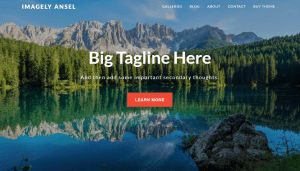 Imagely’s Ansel theme is designed for photographers. It includes 14 different gallery options and several different blog layouts. There are two types of themes that you almost never see listed as a category at various theme shops: “general-purpose” themes and “multi-purpose” themes. That is because a good general-purpose or multi-purpose theme is often the flagship or maybe even the only product that vendor offers. While some theme shops focus on creating themes for lots of different niches, these themes can do duty across the board. General-purpose themes are flexible themes that can be used for many types of website. They tend to be light-weight, start as a “blank slate,” and have lots of customization options. Because they are not targeted to a specific niche, you may need to spend time designing and tweaking your settings to get the look you want, or your site might end up looking like hundreds of other sites that use the same theme. General-purpose themes are popular with do-it-yourself and one person freelancers. They are especially popular these days because they tend to work well with page builders like Beaver Builder or Elementor. The Astra Theme is very fast, lightweight, and customizable. 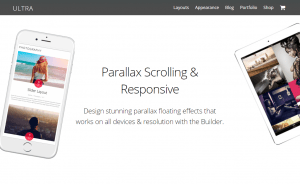 It was designed to work with page builder plugins. 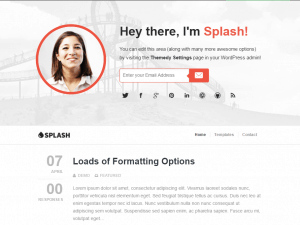 The theme is a free download from WordPress.org and there is a premium plugin that adds additional features. 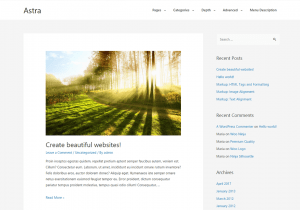 The Generate Press theme is a free theme available from the WordPress.org theme repository. There is a premium plugin that adds many advanced options. Generate Press is one of the most popular themes, the support is excellent, and it works well with page builders. 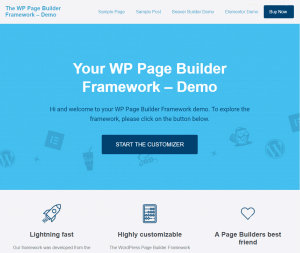 The WP Page Builder Framework theme was designed specifically to work with page builders. There are a lot of options in the Customizer for areas that are not usually styled with page builders. The theme is light-weight and loads quickly. Hum, this may sound like the category above, but multi-purpose themes have a lot of functionality built-in, in addition to look and feel options. They have a page builder, tons of customization options, custom post types, landing page layouts, A/B testing functionality, sliders, a contact form, and more. This type of extended functionality is often found in plugins, but with multi-purpose themes, it is built-in. When I think of multi-function themes I think of them as the “Battlestar Galactica” type of theme that is not necessarily fast or light-weight, but which is very powerful. There is often a learning curve, bundled functionality you don’t need, and might be slow, especially when editing. Multi-purpose themes are popular with designers and agencies that want to use the same theme for many client projects. Due to their flexibility and bundled functionality, they are very adaptable. Popular multi-purpose themes sometimes have their own communities and marketplaces, so it is possible to get help from other users. 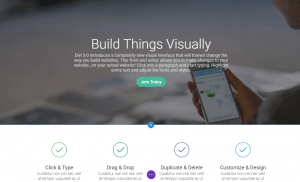 Divi is a multipurpose theme that includes a drag and drop page builder, a visual frontend editor, more than 40 content elements, prebuilt templates, split testing, and more. It is one of the most widely used premium themes. 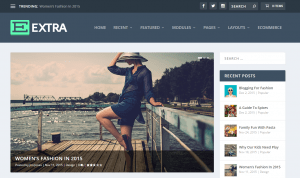 The Ultra Theme is a multipurpose theme that includes a page builder, site “skin” designs, pre-built layouts, multiple header layout options, section scrolling, and many more features. 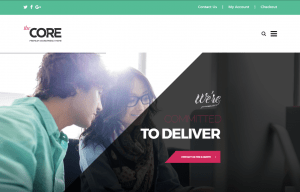 The Core multipurpose theme comes with 20 site designs, a page builder, page layouts, sliders, color schemes, lots of Customizer options, and much more. I hope you’ve found this review of theme types useful. Good luck with you search for the perfect theme and your site building efforts.